L: 32" x W: 16" x H: 35"
Maeve Accent Cabinet If you love pieces that look as though they've been in the family for generations, the Maeve collection is the perfect choice. Corner pilasters and wood-scroll cutouts create an heirloom quality, while antiqued brass hardware offers even more classic elegance. The textured gray-blue finish adds a delicate feel that will look simply stunning in your entryway, dining room, den or any other spot in your home. If you love pieces that look as though they've been in the family for generations, the Maeve collection is the perfect choice. Corner pilasters and wood-scroll cutouts create an heirloom quality, while antiqued brass hardware offers even more classic elegance. The textured gray-blue finish adds a delicate feel that will look simply stunning in your entryway, dining room, den or any other spot in your home. Maximum Weight Capacity: 64 lbs. 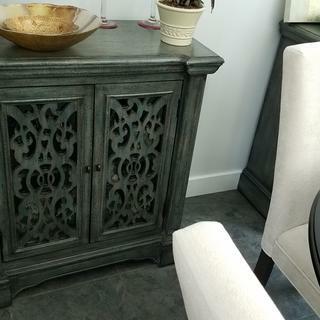 I love this accent cabinet, it looks amazing in my living room and the color is just beautiful. It matches with everything, it's sturdy and I love it! Beautiful. Great purchase. Doors aren't cheap. Would buy again. Beautiful sturdy cabinet!! Looks amazing in my livingroom.. I have placed all my liquor and some glasses and bottle openers in this stunning piece!!! I cant say enough about it!! I love my new cabinet; it makes my foyer look like a totally new area. Cabinet looks just like the online picture. Very happy with my purchase. I would definitely recommend this item. This accent cabinet has a quality look and is built well. The color is beautiful and versatile. Very nice. Delivery in 2 days! Beautiful color and elegant looking. Just what I needed for underneath my tv. I love this cabinet ! It adds color to the room . I use it as wine cabinet for bottles and glasses . It is extremely sturdy . I love this cabinet! It adds color to the room & I use it as a wine cabinet.It is very sturdy. 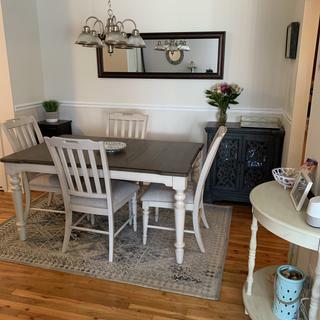 I bought 2 of these cabinets for my dining room several months ago from the Lakewood, New York Raymour & Flanigan store and they still look brand new. Exceptional quality and beautiful color. Very nice looking, roomy sharp looking. All looks great together Draws close when you push and they will close them self. BEST ANSWER: The color is an antique/vintage deep blue/teal/grey it is pretty close to the online image, maybe slightly brighter. It has variations in color as most vintage pieces do. This cabinet is well made, I love it. I would buy it again. It’s a good statement piece. The color is EXACTLY what it looks like in the photo noted. I would call it a deep-blue-grape look. It is a lovely piece of furniture in my living room. Goes well with 'blue' scheme; also with most other colors. Fits in with my early American dining room set in the same room. It appears to be a dark green cabinet with bits of blue and black in it. I'm sorry. It's hard to be specific. But it's a beautiful piece. It’s pretty accurate to the picture above. Mostly blue with a weathered look to it.